It’s here. It’s here. It’s here. OH LORD ALMIGHTY, IT’S FINALLY HERE. Well…it was here a week ago. Game of Thrones Season 5 started last Sunday and shattered viewing records even when half of the season’s episodes leaked online. I’ve been waiting all semester to pair Game of Thrones, so let’s not wait any longer. Hit play on the link below, and let’s get on with it. A quick summary: In the fictional land of Westeros, the Iron Throne in King’s Landing (and who sits in it) controls who lives and who dies. And in a land where power controls everything, the ruling family can determine the fate of a kingdom. But who sits on the Iron Throne isn’t the only thing of concern for the people of Westeros. North of the wall, there are supernatural forces brewing, forces that will bring the citizens of Westeros to their knees. I know that’s a lot of vague description, but hey, no spoilers right? “The Wars to Come” did a really nice job of setting the tone for this new direction that show will be taking. Since George R.R. Martin will be maintaining his distance from the show to finish his books, Benioff and Weiss will be taking control. Game of Thrones has been the best fantasy show on television since its start, but the Season 5 premiere marks a change for the show. There’s a tangible tonal shift even in this first episode; there’s no definite power structure, characters aren’t where they have been for the last few seasons and alliances are swiftly changing. Martin’s involvement with the show, while reassuring for quality, kept the pace slower than it needed to be at times, and I’m encouraged with the direction Benioff and Weiss are heading. It’s got potential to be better than it ever has been. The same goes for the beer. Ommegang is one of my favorite breweries, in part because they’re willing to stick to what they know: Belgians. 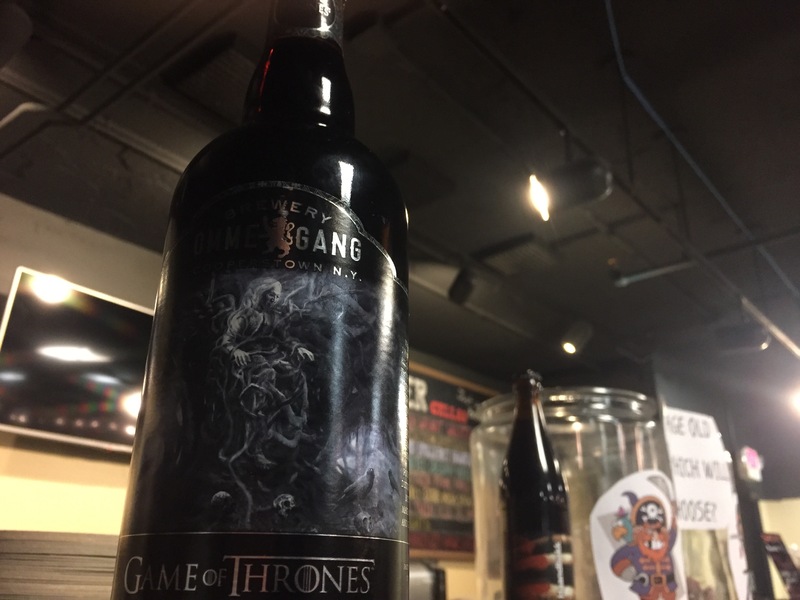 Three-Eyed Raven is a bit of a shift for Ommegang. It’s not only a Saison, it’s a dark saison. That’s a risky move for a brewery known for their Quads and Abbey Ales. But, wow, did this move ever pay off. Three-Eyed Raven is the best dark saison I’ve ever had, perfectly balancing lighter Saison qualities and dark, roasted notes you might sometimes find in a stout or a porter. It’s a bit perplexing once you’ve familiarized yourself with Ommegang’s regular fare, but that doesn’t make it less enjoyable. On the contrary, it’s nice change. It’s challenging, just like the changes in Game of Thrones.